Canadian researcher Vivian Krause says American progressives are working to stop development of the oil sands, as well as any pipelines that might move its petroleum to refineries. Vivian Krause discussing the coordinated and well funded campaign to landlock Canada’s energy exports. The Alberta oil sands region potentially contain more petroleum than Saudi Arabia possesses and has been the target of environmental groups in Canada and the U.S. for more than a decade. Actress and activist Jane Fonda made a hugely publicized trip to the region in 2017, claiming that the oil sands project was not only an environmental travesty but showed a flagrant disregard for First Nations land. As the Calgary Herald reported, Krause was in Calgary on Wednesday, speaking to the Indigenous Energy Summit and told the largely Native crowd of the Indian Resource Council (IRC) why there is so much opposition to the oil sands and pipelines from environmental groups that always seem flush with money. 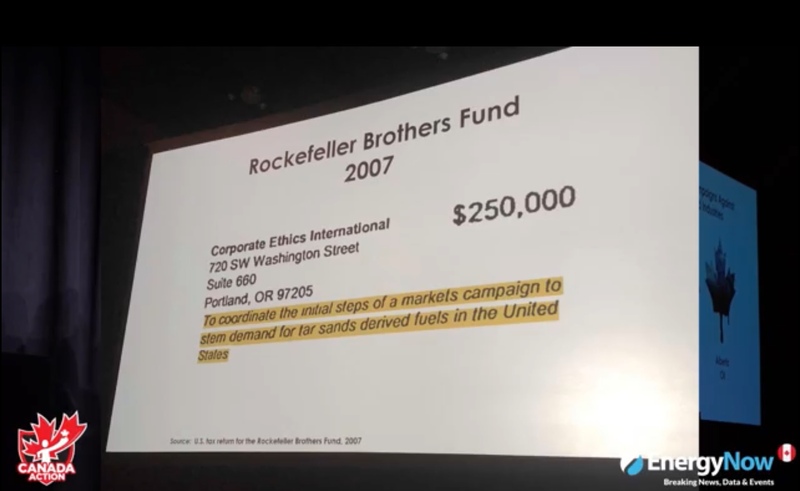 They are being supported by American progressive groups that are, in turn, financed by the Rockefeller Brothers Fund. B.C. Researcher Vivian Krause speaks to the Indian Resource Council in Calgary on Jan. 16, 2019. Facebook screenshot. She warned the IRC that if it does end up buying the pipeline from the Trudeau government, they will “get a foreign-funded campaign along with the pipeline” that would put American progressives in direct opposition to oil patch workers and First Nations bands. A slide from Vivian Krause’s presenation to the Indian Resource Council in Calgary on Jan. 16, 2019. Facebook screenshot.